This was an interesting (and slightly unexpected) month. To start with, while the numbers at the end of this post might seem to show otherwise – we have definitely hit the slow portion of the year. The very first few days of the month, my husband had a slew of freelance jobs pay – resulting in, for all intents and purposes, no outstanding invoices. Meaning – no checks waiting to come in until work picks back up, and more invoices go out. And even when more invoices start going out – it can be a couple of months on average for checks to start coming in. It was also an odd month in that the way I get paid, is every two weeks. This means two months out of the year, I get three paychecks in the calendar month. This happens to be one of those months. To top off the “this is not a normal month” list, we’ve had family in town for a week and a half helping us with a remodel of the garage. Normally, a project of this magnitude would wait until someone is out of Baby Step 2. However, in this case, the HOA is painting all garages this summer and they were going to “just fix” any with rotten wood and charge us. We thought it would be better to fix it ourselves so that it was done right, and done without having a huge gaping question mark to our home maintenance budget. Fortunately, we were able to cash flow this project with the unexpected checks that came in at the beginning of the month. We estimated high on what the renovation budget would need to be – and ultimately, it didn’t directly affect our normal monthly budget, but it did take way from what we could have paid off. One Major item to note – With this month’s extra debt paid – we are now over the 1/2 mark. Which is terrific since June is the 1/2 point in the year. It’s so hopeful seeing focus and determination pay off. We might actually make our 2012 goal! We will have to wait and see how the next quarter goes – we’ll certainly get behind on the pace we need to finish – but there is always hope that the 4th quarter will be outstanding and catch us back up. We have a queen size bed, and up until two days ago, the mattresses sat on a metal rail. It was ok, but I noticed that when I would reach over my head to fluff my pillows to read, on several occasions, my hand would hit the wall. Which would not be a big deal except that I seem to keep scrapping the blue paint off is spots, revealing the mustard orange/yellow color underneath. 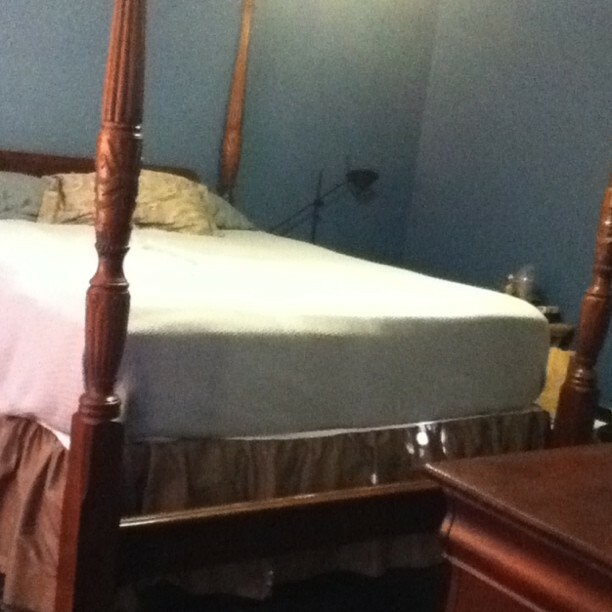 Since I first did this (the very first day after painting), we’ve talked about trying to find a headboard for the bed. Then, with the arrival of our beautiful dresser, we knew we wanted one that would match the cherry wood stain. Our other requirement was a low foot board. While sleigh beds are pretty, high foot boards can be annoying for tall people. That leads us to two days ago. Money is tight right now, so I’ve been looking at Craigslist and thinking about how we can get a decent bed for a good price. The bed is more of a want, not a need – so no need to go spend a lot of money on it. On Saturday, we noticed a local furniture store was having a “going out of business” sale, so we figured we’d head over on Sunday and check it out.